In the currently embryonic stage of the metals recovery, one ASX listed junior may represent a prudent investment as it continues to punch well above its weight. The company has three distinctly opportunistic metals projects located in Australia. The trifecta of assets in its possession will allow this company to move sharply and assertively towards a unified position of having base and precious metals resources safely under its belt. This ASX company has a 100% interest in the Kempfield Polymetallic Project, located in the neighbourhood of Australia’s first discovery of gold. The area hosts world class, multi-billion dollar deposits including one of the largest underground copper-gold mines in the southern hemisphere, Newcrest’s Cadia Valley Operations. Cadia produces as much gold in just one year that other mines produce over their entire life – a whopping 2.4 million ounces in 2016, and according to Newcrest, still has 43 million ounces of gold resource remaining. Today’s company would be hoping to capture some of that lustre, as it goes about completing quite an aggressive drilling program. In fact, its stated goal is to become a leading polymetallic producer through the production of 1.5 million tonnes per annum with a mine life of the order of 20 years. That is some way off, however this cashed up company drilling three highly prospective targets is certainly making a good start on meeting its lofty ambitions. It must be noted though that like many mining plays, today’s stock should still be considered a speculative investment and investors should seek professional financial advice if considering it for the portfolio. Kempfield is the company’s flagship project, already with a substantial Mineral Resource of 52 million ounces of silver equivalent of lead, zinc, silver and gold at a silver equivalent grade of 75 g/t Ag Eq — which has been recently upgraded to JORC 2012 standard. A mere 37 kilometres down the road from the Cowal mine, acquired by Evolution Mining for US$550 million, this ASX stock also has a 51% interest in the significantly sized West Wyalong Project. This company identified of a substantial porphyry copper-gold target here with a magnetic survey in July 2014, and a nearby gold target in 2016. It is now in the process of earning a further 19% for a 70% share in the project equity through exploration expenditure. The company recently started a diamond drilling program at West Wyalong, with the first diamond drill hole in 17 years initiated to test the undrilled multi-survey anomalies. The program totals 2,300 metres in six holes, over a strike length of 1.8 kilometres, with the deepest hole to be drilled to a depth of 500 metres. A further diamond hole will test the gold target to a depth of 400 metres. Furthermore the Company has entered into a joint venture agreement, and has been appointed manager, to earn up to 90% of the Loch Lilly Project on low risk/high reward JV terms. Drilling will begin in late May 2017, when West Wyalong drilling has been completed. This ASX company is trying to discover whether or not Loch Lilly is a significant VMS deposit. For those that don’t know, volcanogenic massive sulphide (VMS) deposits yield significant amounts of lead , silver, zinc, copper, and gold. In fact VMS deposits supply 40% of Canada’s silver production alone. Canada is a long way from NSW, but it gives you an idea of how important VMS deposits are. 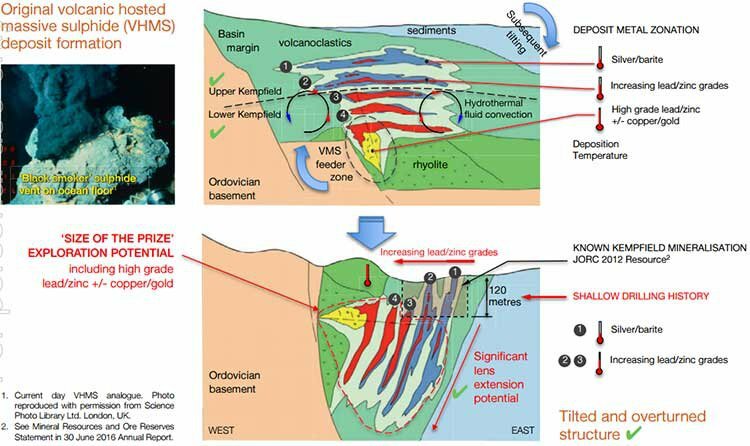 So the company has a few irons in the fire and with of one of Australia’s most highly-esteemed geologists Dr. Tony Crawford in its corner, this company is hoping to make a game-changing discovery soon. Dr. Crawford’s work in delivering initial exploration guidance to Sirius Resources, led to the Nova massive sulphide nickel deposit discovery in Western Australia, which was swiftly followed by a $1.8 billion takeover of Sirius by Independence Group, now rapidly progressing the Project all the way through to production as a world class development. It’s this man’s geological expertise that can help to unlock substantial commercial results for this company. This company’s exploration program is working full tilt to publish exploration results for all three of its key projects over the next few months, and a Resource upgrade for its flagship project at Kempfield. That’s exactly the kind of stuff we like to hear from our small-cap steeds, galloping out of the ASX starter-gate. With a fine blend of potentially elevational-share-price news and catalysts standing by, we think this company could be on course to be certified as a best-of-breed explorer. With anticipation growing and plenty of other metals developers jockeying for the best tenement positions around Australia, we’re quietly confident this overlooked stock could get one of its steeds past the gate and revel in the commercial rewards on the winning podium. It’s still early days in the newly resurgent metals race, but the going is good to firm. 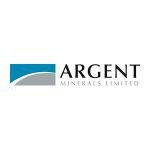 The future is looking rather bright in the near term for Argent Minerals (ASX: ARD). ARD is a multi-metals explorer, currently capped at $15M, with three metals projects from early-stage to advanced, all in close proximity in NSW to existing infrastructure. Interestingly, the company has State-support from the New South Wales (NSW) Government. This cashed up company with $1.6 million in the bank at last count and $350,000 in merit based co-funding awards from the NSW government, has been picked for its business strategy, exploration plan and commercialisation potential, from around 50 applicants to progress its NSW-based metals aspirations. The projects ARD is working on, collectively offer a spectrum of both base and precious metals. Better yet, the early drill results at each of ARD’s NSW projects seem to stand up to initial estimates of commercial viability, with one project already sporting a JORC Resource that just needs some tender loving care to advance it toward production. What really impressed us about this stock, was the optionality. ARD now has a wide range of options to choose from in terms of how best to progress its development towards a strong commercial finish. Gold, silver, copper, lead and zinc are all comfortably taken care of, within ARD’s existing tenements in NSW — and the plan is to commercialise whichever metals resources it manages to haul in through Feasibility and Scoping studies currently ongoing at all three sites. ARD has clearly parachuted into a region busting a gut with existing metals projects belonging to the likes of Toho Zinc, Glencore and New Gold, operating their respective mines, Endeavour, CSA and Peak Gold. For ARD, the ultimate plan is to emulate these trailblazers all the way to the bank Bankable Feasibility Studies that could ensure a huge injection of cash to build the required infrastructure. It’s all part and parcel of prospective Resources investing, and we think ARD has a chance of rewarding the early birds that nestle on its share register. Seeing ARD climb like it has is a pleasing sight for ARD investors, so let’s take a look at what’s buried down below this ASX junior with plenty of metals potential, and a bucket load of technical clout to ensure its potential is realised. 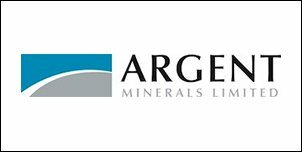 ARD is in a great position to advance this project towards a major copper-gold discovery, and then a JORC Resource and eventually, commercial sales. With its ensemble of projects, ARD hopes to develop both optionality in its exploration, as well as substantial commercial returns. Although this result came from just one drill hole, the reading was not an anomaly. ARD’s project sites seem to contain ample quantities of base and precious metals, at commercially significant grades. Let’s breeze through ARD’s Projects to see just how much of a bonanza ARD can deliver to shareholders. Located just 41 kilometres from the world famous Cadia mine is Kempfield, ARD’s flagship project, a registered New South Wales State Significant Development owned 100% by ARD. The Kempfield Polymetallic Project has a substantial Mineral Resource of 21.8 million tonnes and 52 million ounces of silver equivalent contained metal that was upgraded to JORC 2012 standard in May 2014 – but ARD is chasing a lot more. The great news from the Kempfield site is that a fresh drilling campaign was recently completed with 8 diamond holes targeting silver, gold, lead and zinc – and investors liked what they saw from the first batch of results. This upside will be realised if ARD is able to substantiate the theory that Kempfield has more to add to its locker. It’s worth noting that the Kempfield project is located adjacent to several world-class VMS deposits with proven multi-tonne resources belonging to the likes of the $117M capped Red River Resources and MMG. Yet, whether ARD can reach these heights remains to be seen and investors should therefore take all publicly available information into account before making an investment decision. So now you understand the potential of Kempfield, let’s take a look at ARD’s two other highly prospective projects. West Wyalong is currently a JV project on a 50:50 basis, with ARD looking to earn into a 70% stake over the coming months. Drilling is now underway at West Wyalong and will be conducted from North to South to test key positions of a potential copper-gold porphyry system and telescopic epithermal gold system. Drilling will consist of six diamond drillholes to 350 metres depth with extensions on hole AWT004 to 500 metres depth, and hole AWN001 to 400 metres depth. Looking at the local vicinity in terms of peers, indicates that ARD has parachuted into a metals savannah. Take a look at the magnetic intensity graph which helps to narrow down metals deposits on the basis of chargeability. Also notice the string of deals done in this region over the past two years. Sandfire Resources (ASX:SFR) acquired Straits Resources in order to snaffle up the tenements below ARD. In 2015, Evolution Mining (ASX:EVN) acquired highly prospective ground from Barrick. The strategists at Evolution also grabbed the Cowal mine for US$550 million last year. 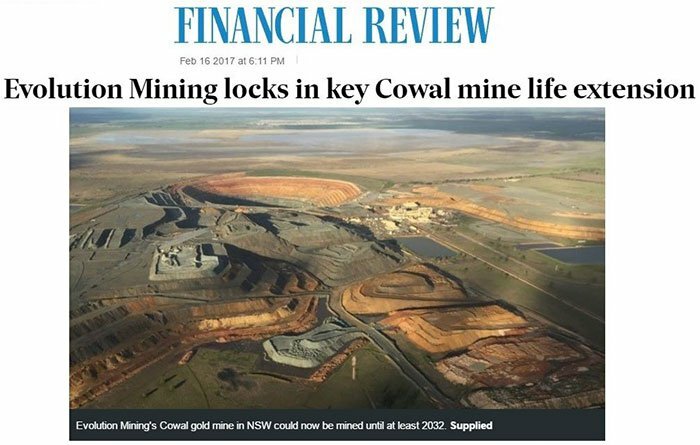 The Australian Financial Review called Evolution’s Cowal acquisition as its “golden centre”. If this region has enough lustre for Evolution, could the sheen carry over to the $15M capped ARD’s current exploration? The signs so far, suggest that ARD has a lot of work to do — but the eventual rewards are there for the taking, as long as the exploration goes to plan. ARD’s Loch Lilly Project is its most recently acquired and least developed, but ultimately, could become the company’s flagship project. The reason for such high-“potentiality” is two-fold. 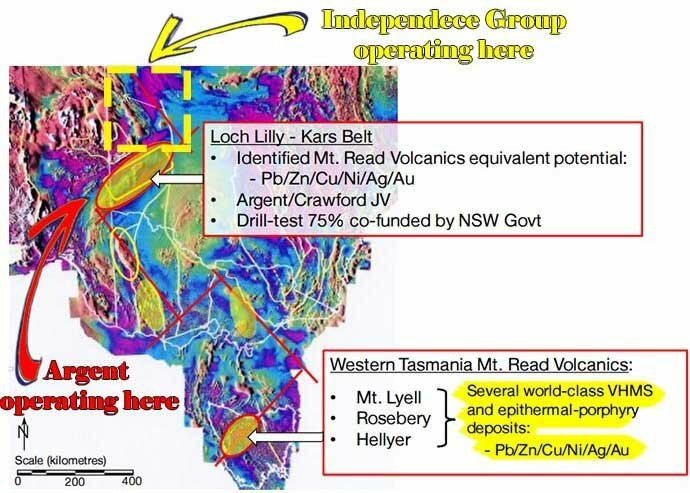 One, Loch Lilly has been identified as a potentially significant deposit because of its stark geological similarities to other base/precious metals deposits in the Tasmania region including those of Mt Lyell, Roseberry and Hellyer, all several world class VHMS and epithermal-porphyry deposits. This identification was done by one of Australia’s most highly respected metals specialists, Dr. Tony Crawford. Dr. Crawford has a reputation for having a keen eagle-eye for bonanza grade projects, and with the technical know-how about how to best tackle exploration to advance them to discovery. He is an internationally recognised expert in VMS deposits from his association with the Centre of Excellence in Ore Deposit Research (CODES) at the University of Tasmania, where he served as a Professor alongside Professor Ross Large – both of whom have also provided valuable guidance to ARD for Kempfield. Take a look at this regional map, with yet another ASX metals developer touching down adjacent to ARD, in the same vein as the hustle and bustle at Kempfield and West Wyalong. The first ever deep diamond holes at Loch Lilly will commence in May 2017, and with over 1,447km 2 of real estate under its wings, and with Mr. Large’s twinkling eye on board, ARD stands on the cusp of potentially uncovering something substantial at Loch Lilly. ARD will earn into 90% of the project as more exploration is done, which brings us onto a very neat-and-tidy caveat working in ARD’s favour: Government funding. ARD’s Projects have been meticulously assessed for best prospectivity by the NSW Government Cooperative Drilling Fund. Out of approximately 50 project applications in the most recent round, only 14 were selected to be sponsored by the NSW Authorities. Whereas some developers probably managed to secure funding for one of their projects, ARD has hit a bit of a grand slam by securing funding for all three of its projects. This now means that ARD funding will receive a boost of up to 50% of the West Wyalong drilling underway, and 75% of the drill-test costs for the first two deep holes at Loch Lilly. ARD is in a strong position to emulate some of Australia’s brightest metals prospects, courtesy of opportunistic acquisitions in respects to both tenement holdings and personnel working ARD’s ground. With one of Australia’s pre-eminent experts on NSW’s geology on board at ARD, its chances of success are well and truly, alive and kicking. Whilst ARD has established an initial goal of discovering an additional 5 million tonnes at Kempfield with higher grade lead/zinc, silver, gold and potentially, copper, the potential for a much larger system and associated world-class discovery has also been identified. If Kempfield’s potential is good, then West Wyalong and Loch Lilly provide further supplementary indications that ARD will manage to raise its valuation and share price over the course of 2017. If ARD is successful in adding Mineral Resources to its Kempfield Project, it could propel this little steed into game-changing territory in NSW — a region bustling with copper/gold/zinc producers and teeming with takeover activity. That’s exactly the type of stable we like our steeds to occupy. Yet ARD still has some way to go before achieving this aim, so seek professional financial advice if considering this stock for your portfolio. ARD presents a fine spectrum of opportunities spread across several metals, projects and timeframes. Kempfield, a near-term target, is followed by West Wyalong as the mid-term target with Loch Lilly offering a potential mother-load of blue-sky over the long-term, just across the fence from Independence Group. The outlook for catalysts is also very rosy. ARD is likely to be reporting drilling results and possibly Resource additions, for the entirety of 2017 if its drilling goes to plan. The going is good to firm on the metals recovery, and we think we may have found three prized steeds that have the distinct pedigree of being able to clear all the explorational fences, as it gallops toward completing its drilling programs and releasing what are expected to be very positive results for this interest piquing poly play.